Standing idle in a barren land, the sight of Moulin de Daudet sets free the poet within. The windmill has a history dating back to the 1814. It was functional for about a century before it lost its purpose by 1915. 20 years post that, the association named ‘Alphonse Daudet’s Friends’ decided to restore it and establish a museum dedicated to the famous writer. Not much remains to see here with the place being closed down since 2012. The lonely building is a symbol representing Alphonse Daudet and his works. It is said, that years ago, he used to sit by this very place and write. The result of these writings was ‘Les Lettres de mon Moulin’ which translates to ‘Letters from my windmill’ in English. 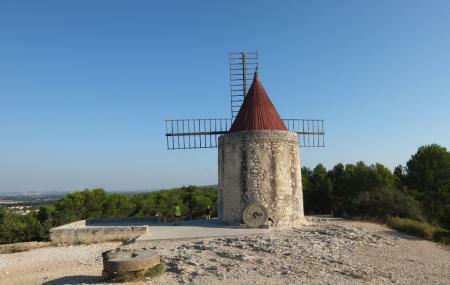 Originally the windmill went by the name of Ribet or St. Pierre Moulin. Even with no museum and no functioning mill to see, many people visit Moulin de Daudet either to pay their homage to the legendary writer, or to simply enjoy solitude in the calm of this lovely place. Love this? Explore the entire list of places to visit in Arles before you plan your trip. Fancy a good night's sleep after a tiring day? Check out where to stay in Arles and book an accommodation of your choice. How popular is Moulin De Daudet? People normally club together Place De L'horloge and Musee Calvet while planning their visit to Moulin De Daudet.